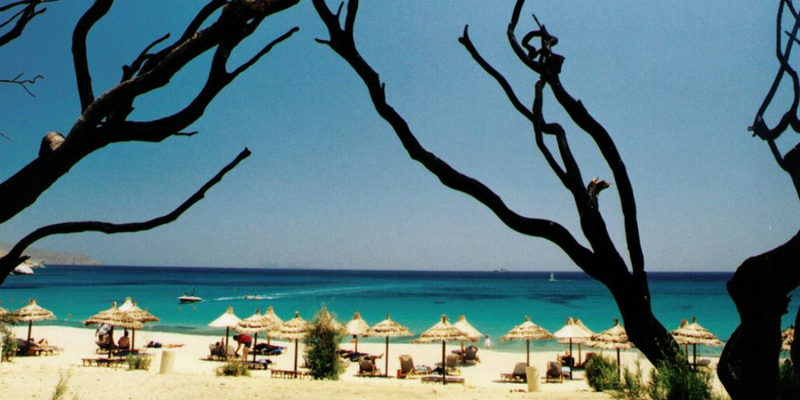 Kalafatis beach is located on the southeast of the island, 12 km from Mykonos town. It is the only beach on the island surrounded by trees, which creates at some parts, natural shade. It is one of the biggest beaches of Mykonos. Kalafatis beach is more popular to those who love water sports. Everything can be found there; from canoe, Jet Ski, wind surfing, and many more. There are also beach bars and taverns with great food. You can reach Kalafatis by car, taxi or local bus.